Having watched as first Ulthok then Weaver could not open the iron door she was not surprised that Sirene was able to do so magically. Inside was a prison room of mostly empty cells but three occupied. The inhabitants of one cell immediately caused her bow to rise and an arrow knocked and drawn. Sighting down the arrows length she let it fly. Posted on 2014-04-20 at 23:31:18. Immediatly after the Knock Spell was cast, Ulthok was right back at the door, cchecking it for locks. Finding none, the door was gently opened. As the party advanced through the doors, it seemed as if they had come close to a lucky break. It was a dungeon. Cor quickly looked around for any signs of the Dragon Queen. There was none. When Cor passed by the battered dwarf, he glanced at him. It seems this dwarf had been a warrior of some sorts. Maybe he could be help? Ulthok quickly searched through the other cells. He found one that had been occupied for a while, with white lace shoes and a pure white shawl. Quickly moving to the next cell, Ulthok searched through it before turning with a hopeful smile on his face. "That's excellent! That means we could find her soon!" Cor said. He was glad that they had the chance to find at least one of their allies. It had been a disaster so far, losing Lady Jessica, Bareel, and Valene. "Nay, not one of my clan. At least, not one I knew." Cor shrugged, turning to face the dwarf. Both Sirene and Cor approached the dwarf in his cell. Sirene was the first of them to speak to the battered man. "We're friends! We come from the kings army." Cor paused, waiting for the dwarf's response. "Now, if you answer the questions, I'll heal you. You look pretty banged up." Cor sincerely hoped the dwarf would answer. They seemed to be close, but they needed all the help they could get to find the Dragon Queen and blow up this castle. Posted on 2014-04-21 at 00:00:35. With that announcement, everything changed for here was proof that the party�s Halfling Thief/Cleric possibly yet lived. With the white shoes and shawl evidence of yet another captive, clearly female, the second question became had the Dragon Queen been held here also. For the party to gain the answers now sought they had only three Orcs, a defeated beaten Dwarf, and a mad Human to ask. For Rayne facing her SPECIES ENEMY it took only seconds for her to raise Andurial�s Blood and kill the three Orcs without a moments thought. However as she drew to fire Lothor�s steadying grip of friendship on her shoulder and his other hand on the bow stopped her draw. As Lothor moved her a short distance away from the cell, calming speaking to her the short walk, both took up guard positions. With a last look of hatred at the three Orcs, she turned to watch both entrance doors one to the East the second to the West. Peri mistaking somehow that within the humans rage was pain acting on her own moved and blew onto the human a cloud of euphoria gas. For the briefest of moments the rage seemed to calm, Peri turning to speak to the closet party member. Then as if it had never left him the human was at the bars reaching for the Faerie dragon herself. Barely dodging the spit from the shouting mouth and the humans reaching hand Peri landed once more upon Ulthok�s shoulder, her attempt at sanity for the human a failure. For Aliya seeing the lack of success by Peri thought to take a simpler approach. Pulling a piece of bread from her pack, she tossed it to the raving man. "Answer as best you can, and I have more for you. Answer well and their may be drink as well..."
Aliya was unsure if this tactic would work but it was one they could use with out getting closer to the man. The man looked more then half starved, Alyia wondered if that was because of the captor�s treatment or the madness, which gripped him. However, the Fighter/Mage was not fully prepared as the man picked up the piece of bread and quickly threw it back into her face, his gibberish for just a moment sounding southern in nature. Wiping her face of bread, she moved away. For Ulthok the possibility of getting the three Orcs to speak was a better chance then the insane human. With his ability to speak to them was another plus in the Halflings mind. Moving directly to them, he spoke in the Orcish tongue. Ulthok realized he was blasting forth many questions and slowed himself. He hoped the others would gather information and that maybe the Enchantress might be to help with the Orc too. To his amazement, the largest of the three Orcs stood and moved to the bars. Roan seeing Ulthok�s blunt series of questions fail moved to try a different approach. Revealing the silver valknut worked into the leather straps of his bracer he spoke to them as Ulthok had in Orcish. Once more it was the standing Orc that answered the Human Ranger/Cleric after spitting on Roan�s boots. �BAH! We have no need of your puny weak god, we worship the great He Who Never Sleeps, the Greater God of Orcs. Right now He Who Watches is looking down on us with praise for we took our punishment and lived. And with full bellies!� Once more, the three Orcs together seem to take joy in their jailing as the leader moves to rejoin them. Suddenly as if in slow motion, a streak of light flew past Roan to strike the Orc leader in his face. In one second, what had been the face of a living breathing disgusting orc became a cloud of blood and bone to cover the other two Orcs in the cell. As the body hit the ground Rayne moved close to the cell, her magic bow readied. Her gaze never leaving that of the surviving two Orcs, her hatred plain on her face and in her eyes she spoke quietly to Roan and Ulthok. Weaver having moved along with Cor to the cell of the beaten Dwarf saw a dwarf with no resemblance to the dwarf beside him. Looking at the Dwarf, Weaver could see a person played with as if a toy, beaten, humiliated, depraved of all things normal. Yet the Ranger/Bard hoped yet still for a spark of defiance. �Cor, one of your brethren?� Weaver asked. �Nay, not one of my clan. At least, not one I knew." Cor shrugged, turning to face the dwarf as Sirene came to stand beside him. For Siren her ability with magic had so far been an advantage few in this attack upon this flying castle had, and once more, it proved its worth. Moving first to the Orcs she calmly stood behind as first Ulthok then Roan began to question them. The thoughts and Images were strong at the mention of Valene and the one they called �The White Witch� The Orc leader in particular had the strongest of these. However as quickly as the images came they were gone, Rayne having blown the leaders head into nothing. Turning to scowl at her fellow Elf, so intent on the two yet living Orcs, that she failed to see it. With a quick recap of the images gained from the Orcs minds relayed she moved to the Dwarf as Cor begin his work. "We're friends! We come from the king�s army." Cor paused, waiting for the dwarf's response. Though the beaten Dwarf looked to Cor at the sound of a Dwarven voice to clearly see another of his own race he did not speak. "Now, if you answer the questions, I'll heal you. You look pretty banged up." At this the Dwarf seemed to smile, the smile spreading as the Dwarf prisoner opened his mouth to show he had no tongue to speak. Knowing that he had nothing to heal the loss of the tongue he still cast some comfort upon the Dwarf in the form of a Cure Light Wounds. Turning to Sirene Cor nodded his head. "Dear friend of the mountain, what can you tell us of this place. Who was here before? There were two women, the owner of the white shawl and another, perhaps a bit shorter? What can you tell us of them? How did they leave this place? Do you know where they were going?" Here the images were jumbled, mixed, overlapping each other as if to seem the same as one long thought. Though clearly not insane as that of the Human, the Dwarf was very close, yet wait, yes a tiny spark of will remained. The Elf Mage/Druid Enchantress knew Cor had his work cut out with the healing of this one but there was still a chance. Once more a quick recap of the images gained and she moved to the last cell to join Weaver who was already there. Weaver, having left Cor to do what he could for the battered Dwarf had moved to the cell of the wild human. He was soon joined by Sirene and watched quietly as the Elf Enchantress began her scan of his mind with her newly gained ability of ESP. For a moment, she stood calm, her mind probing forward, then it was suddenly not totally her own anymore as a vast black darkness moved to engulf her mind and strip it from her body. With a sound not that far off the crazy human, she fell to the floor as if in a seizure, her Elvin body shaking uncontrollable. This darkness Sirene could tell as she fought a loosing fight wanted her being but not her sense of self. A chalice of sorts it could fill with its dark being and leave the confines of this place. This darkness more energy then living creature wanted her body leaving nothing else. Sirene knew this fight was lost the minute her mind had touched it. For Weaver, standing next to Sirene, was at once on one knee cradling Sirene�s body and head on her side to prevent her from chocking. Found yet again he was not fully alone inside his own mind. �Who is there? Brother, who do you have with you?� He always knew whom his brother was with, but not this time for he was with two others, a spirit of vast darkness lashing out at a spirit of dwindling light. In the mix of the two different sphere�s all Weaver could tell was his brothers form. Sirene was not giving up but her mind was losing, losing what, me? Wait who am I, SIRENE I�m Sirene Tele Melete, no you�re not, Yes, Yes I am, am I? Her body convulsing on the floor held on her side by Weaver, spittle starting to form in her mouth, her eyes lost somewhere in the back of her head. The Elf Enchantress started to fade. Posted on 2014-04-21 at 06:23:52. With a solemn glance to Cor, Sir�ne let the dwarven cleric go about his work with the imprisoned dwarf. She deliberately stepped away from the cell and moved further into the room to stand beside Weaver. Side by side they stood facing the raving madman, his wordless growls hissing forth with an animal rage. Bits of bread lay on the floor before him in evidence of a hunger for wrath alone. Words and generosity would do little to convince this man to aid them. She doubted if there was anything human left in his madness. That kind of sickness twisted the mind until there was nothing left but the insanity. It was a favorite punishment among her kind. The curse of madness was the prized weapon of a high priestess to be hurled into the minds of the enemies of the old religion. Blind with madness, they would destroy the lives of all they held dear until their very self was shatter. Still death would not claim them, they would live out their days without thought or reason. It was a fate worse than death. Sir�ne had laid the curse of madness in the minds of beggars and kings alike, and she recognized its effects. Whether this man was under the grips of some fey curse or had lived a life in which madness consumed him, she could not tell but the result way the same. Looking into his eyes, she found no trace of humanity, only madness. Still, wrapped up in his mind might be some knowledge of this place or what had come to pass. They could leave no stone unturned, and so, the enchantress turned her cerulean gaze more intently on the lunatic. With resolve, Sir�ne reached out with her magical awareness to peer into the mad man's mind. In so doing, she touched her mind to his. It was a decision she immediately regretted. As she peered into the madness, another presence reached out. An unrelenting tide of darkness rushed forward, around her, and into her. Within its depths she felt only one thing, hunger. It hungered for her, to be her and to consume her. It was madness and with its touch, it would erase her, utterly and completely. Her body would become its vessel, a tool for its twisted desires. With her body and the magic that flowed through her veins, it would leave this place and darken the would. Sir�ne fought, but who was she to stand against the raging torrent. A single word. It reverberated through her mind, echoing into the very depths of her being. She recognized that voice. It was familiar, cold and full of power, so like her own. You are no weak child of the mortal world. You are a high priestess of the old religion, and you will not fall. I will not allow it. Fight. And so she did. That voice had always pushed her on. Whenever she was tired, whenever she fell, it was there and it had always been there. From the earliest of her childhood, she could hear that voice. It was distant and chiding, but always full of love if not warmth, and it brought forth a rushing tide of memories. A lifetime ago. Sitting before the reflecting pool, with bits of grass and dirt poking into her bare legs, Sir�ne stared at the face looking back at her. A thin, dark line now ran up her forehead, and in time it would turn the deep blue that marked a high priestess. All her life she had wondered what it would be like to wear such a mark, and now she did. It was there, branded into her skin forever. "It is only the beginning." Sir�ne nearly leaped into the skies at the sudden sound of that cool voice. Before she could turn to face the speaker, a face appeared next to hers in the reflection and slender hands gently gripped her shoulders. Their faces were so alike, almost perfect mirrors of one another. The same smooth copper skin and angular features with the same dark, loosly curled hair. Though their eyes burned with the same brilliant aquamarine, the passage of millennia reflected back in the eyes of the woman at her side. Mnemosyne was ancient and sat highest among the fey sisterhood as the voice of the Goddess herself. Her grandmother was not warm, and their blood ties had not served to lessen that severity but rather intensified it. In more that a century of study, Sir�ne had cried all the tears she had, and been filled with the strength of duty. With the ancient priestess she had found the rock of faith to hold onto. Mnemosyne traced a graceful finger along the dark tattoo the she had etched into Sir�ne's forehead, "With this mark, the road becomes truly difficult." With this mark, the road becomes truly difficult.Those words, spoken to her more than a century past, now screamed in her mind. She found herself in those words, a life that had spanned the ages and bore the weight of the will of the Goddess. It had always been a burden, but now it was her salvation. With those words, there against a darkness as vast as the sky and the ocean her being stood. Sir�ne was herself, but she knew this was a battle she could not win. The darkness was too vast, too hungry, and it would consume her. This realization filled her with resolve. Vast though it might be, it would not claim her. Here and now, she would end her own life, and in so doing, send this abomination back to the hell from whence it came. Then, as if sent from the Goddess herself, a warm, loving light filled her world and held the darkness at bay. Within its brilliance stood a lone elven man, smiling with purity and love. He looked so familiar, so like a man she knew. It was barely a whisper, but from her lips she breathed a single word, "Weaver." The shining man smiled and reached out a hand to her, "I am Salick Hovsus, come with me if you want to live." There was no hesitation. Her hand found its way into his and the divine light filled her. Brilliant and searing, it burned through the darkness and she could hear the vile being scream in pain and rage as it retreated back into the imprisoned man. In the back of her mind she could almost see a woman smile. With the darkness gone the world came rushing back. Pain racked her body and her head throbbed, but she knew it was a passing thing. She had survived and that filled her with a joy that knew no bounds. Opening her eyes, Sir�ne found herself cradled on the floor in Weaver's arms. Looking up at the disheveled bard, she could see the concern in his eyes. Slowly she moved to lay a hand on Weaver's arm and smiled with a mix of gratitude and assurance. It had been his brother that had come to her and chased away the darkness, she owed him her very being. "I am alright, dear friend." Sir�ne smiled again as she sat up and rested a hand on the old bard's shoulder. "And thank you, from the bottom of my being, thank you." There she stayed for a moment, staring into his hazel-green eyes. Two sets of eyes that had seen the passage of the ages gazed into one another, and words were not needed. It was a knowing silence. With a final smile Sir�ne stood. Black curls fell about her in waves and her cerulean gaze fell on the imprisoned man, now twitching with madness once again. At the sight of him, she took an involuntary step back. Whatever dark force held him sought its freedom from this place and it had tried to consume her to get it, and she would keep as much distance between them as she could. Even now, after she had touched its essence, she still had no knowledge of what it was. Odd that in this place of darkness there was a darkness even more vile that was held prisoner. As deep as they were in this place, they still knew all too little of the enemy they faced. "Keep your distance from that man. He is beyond our help," Sir�ne's voice rang out through the room, urgent and full of warning. "What we seek was here and left not long ago. We must move quickly from this place." The enchantress kept her words vague, for ignorant as the orcs might have been, they still had ears and she was loathe to give the dark force anymore knowledge of them. It was not yet time to reveal their intentions. Gliding across the room Sir�ne came to the imprisoned dwarf with sadness in her eyes. All the torment he had endured was written clearly on his face. No being should suffer the indignity that the Lich Queen had forced upon him. As the small man went to work, Sir�ne's awareness shifted to the orcs. The leers and growls from within the prison gave her pause. A cruel smile painted across her lips as she gazed at the vile creatures. Then without looking back, Sir�ne turned to face the west door. The githyanki had taken Valene and the Dragon Queen that way, and so, that would be the way they went as well. Almost silent, the elf moved towards the doorway, her feet brushing softly on the stone floor. They were close, she could feel it. With her gaze focused on the western door, the enchantress spoke again, "Our path must follow through this doorway. There we will find what we seek." Then she silently stepped aside to let the halfling thief do his work with the door. Once all were outside the prison room, Sir�ne turned to face her companions. �Indeed, both the dragon queen and Valene were here. They both yet live. The lich queen�s guard came and took them not twenty minutes past. There is little doubt in my mind that they were taken to the dark mistress of the castle. We must find them.� Her words, though spoken softly, rank with the weight of urgency. Posted on 2014-04-24 at 16:46:40. It was dismaying to see the cut tongue of the dwarf. Not only did that mean that he was unable to answer, it showed the fate of any prisoners of War. Cor casted cure light wounds on the Dwarf, if only to give the man some comfort. They had to let the dwarf out, lest he become as mad as the human in the other cage. "We'll get you out of this cage in a second." Cor softly said the the battered dwarf. Looking around the room, Cor noticed very little progress being made with either the orcs or humans. The orcs seemed highly uninterested in helping. Rayne had killed one of the orcs, accomplishing both a strike on her sworn enemies and intimidating the others. The human was no better, attempting to swat Peri out of the air, and throwing bread on Aliya's face. Abruptly, Sirene fell to the floor. Cor was unsure why, but he quickly moved over to her, watching Weaver hold her on her side. A couple moments later, she recovered a regained her footing. Cor nodded to Ulthok. The dwarf must be let free. Cor set his bag of holding on the ground, and began to dig through it for weapons and armour for the dwarf. There was no point of throwing him unarmed to the Queen of this castle. The certainty in Sirene's voice was absolute. Cor felt no need to ask her why she believed this; he would follow her. They had been wandering around this castle aimlessly for long enough. Cor felt satisfaction ride over him; they may be able to pull this off after all. After they had freed the dwarf and Cor had given the dwarf what he could, they exited the room. Cor nodded. "Aye, I think you are completely right." Turning to the rest of the party, he said, " It looks like now that we are going to be entering into the hardest fight we will have encountered in here. If any of you absolutely need to do something, now would be the time." Cor paused and waited for anyone to say or do something. When everyone was finished, Cor turned to face the hallway ahead, "Alright then, let's go find the dragon queen!" Posted on 2014-04-26 at 20:31:03. Ulthok had briefly hoped the Orcs may have seen a chance to escape their cell by giving them information, but they stayed true to their nature. Even being imprisoned by their own kind to await sure death didn�t curb their foul humor, �You ask of the small one like you, ha! We three ate her, which is why we were punished. Come small one let us make a snack of you too, for the female small one roasted very well in BBQ sauce�. Turning he saw Sirene eyeing Rayne; Ulthok guessed the enchantress had been plying something on the Orc. The mage guessed they�d get nothing more from the Orcs so he followed Sirene as she moved on to the Dwarv. There Cor had cast a minor curing spell on Dwarv in the cell to ease his pain. Then the Dwarv opened his mouth to reveal that his tongue was gone and he couldn�t answer the questions. Ulthok started to examine the lock of Dwarv�s cell as Sirene moved on the raving human. Moments later the Enchantress collapsed, Weaver caught her and cradled her. Ulthok, as a mage, knew the risks of casting spells, there is always the chance of something going wrong and this looked real bad for Sirene. Ulthok saw the look of concern on Weaver�s face. The wildness so often in his eyes was replaced with the focus few had seen. The Halfling sensed something terrible was happening to the female druid but almost as quickly as it started the Enchantress opened her eyes and touch Weavers arm. "I am alright, dear friend. And thank you, from the bottom of my being, thank you." Regaining her poise Sirene stated, "Keep your distance from that man. He is beyond our help. What we seek was here and left not long ago. We must move quickly from this place." So as Sirene directed the others to move out through the west door Ulthok and plied the lock. (assuming he opened the cell.) Helping the Dwarv from the cell Ulthok caught Cor, �Better open that bag, this man needs something more to fight in than just his undies.� When bag opened Ulthok pulled out the Elvin Studded Leather +3 armor and weapons. (2 +3 Daggers , Elvin Studded Leather +3 (assume it will size itself)Boots (assume they will size themselves). He pulled a +2 Sling w/50 +4 Bullets, �You know Cor you don�t use that mace to often and this sling is more my style� I�ll lend him Idrenal, (+2 Short Sword SM/Med:1d6+3 LG:1d8+3 #ATKS:1/1. (doubles all damage from backstab)you could lend him a real dwarven weapon." The Dwarv dressed and they followed out the west door. Posted on 2014-04-27 at 02:37:07. Weaver did not see or think. He just reacted; he caught the Lady Sirene and took a knee. Holding her close he began to feel the drain on his mind and body. The body of Sirene shivered in his arms and he kept her from the stone floor. His eyes were not closed but the room to him was gone. He felt her hand slowly move to her dagger. Weaver simply shook his head no. He wanted to speak but words would not be heard. It was not because Weave could not make them, he could not find them. His mind was elsewhere. Where, he did not know but a fog hung heavy in the where that was his here and now. �Weaver.� He heard a single word. Again he shook his head no and again words escaped him. It was then a weight came upon him. It was like the armies of the world walked upon him. Weaver knew this weight and to him it was no burden. The fog began to move away and the room came rushing back in. The Lady Sirene still was in his arms but her breathing was softer like a gentle breeze. Her eyes opened, �I am alright, dear friend.� She smiled; this brought joy to Weaver for this meant she was the Lady Sirene and not the madness. Weaver helped her sit up, �And thank you, from the bottom of my being, thank you.� Weaver was now sitting on the floor across from Sirene. For the first time the two friends truly saw one another. From that moment on Weaver and Sirene shared a bond. Posted on 2014-04-27 at 18:41:50. As Rayne watched the other Clerics rush to help Sirene nestled in Weaver�s arms, she turned to Lothor to acknowledge they could do little to help. As much as she wanted to add her healing there was no purpose in it so she continued to watch the two doors. Within only moments Sirene was ok and addressing the party. I am alright, dear friend." Sir�ne smiled again as she sat up and rested a hand on the old bard's shoulder. "And thank you, from the bottom of my being, thank you." Keep your distance from that man. He is beyond our help," Sir�ne's voice rang out through the room, urgent and full of warning. "What we seek was here and left not long ago. We must move quickly from this place." Gliding across the room Sir�ne came to the imprisoned dwarf. �With pleasure� Rayne responded and even before her words were spoken two arrows were fired and the two Orcs were dead. Then without looking back, Sir�ne turned to face the west door. �The githyanki had taken Valene and the Dragon Queen that way, and so, that would be the way they went as well. Our path must follow through this doorway. There we will find what we seek." Rayne stood ready bow always in hand. Posted on 2014-04-27 at 20:45:59. For the party it could be said no news was good news. However, in this case knowing Valene was still alive and in the company of the Dragon Queen was a boost to everyone�s morale. With Sirene giving Rayne free reign the Orcs were quickly dispatched, yet curiously the dark man was left alone. As for the dwarf he was another story as the parties Clerics cared for him. However as the party collected weapons and armor for him, it quickly became apparent that he would not be much in a fight and would have to be lead by hand. The Dwarves mind to think into coherent thought and actions still had a long way to heal and within these castle walls would get none. Then the party was following Sirene out the door and into a new hallway heading 40 feet east then turning to the South. Another 40 feet sat yet another door, unlike the two metal doors in the prison just left this was again a wooden one. As had become routine Uthlok was quickly to the door checking for locks or traps and finding none. With a look to the party to gauge their readiness, he quickly opened the door. (Ok battle time Boys & Girls you are facing what is shown on the map of the room. As for the two Unknowns both are hooded, the one on the other side of the Large Gith is sized about the height of a dwarf. The one standing next to him is about the size of a normal human but seems distorted somehow as if looking at the creature through blurry eyes. The party left the jail room by the west door following Sirene�s suggestion. Ulthok again lead as he checked for traps and dangers. The Halfling knew they�d be in combat again soon so as they moved down the hall he shared thoughts with the little blue dragon fluttering on his shoulder. Peri gave Ulthok a little peck on the cheek,�Oh silly Rydenham�.they�ll never see what hit them.� Ulthok felt the peck, but when he looked there was nothing but a light pressure on his shoulder. No sooner had they finished when they turned a corner and another door stood at the end of the hall. Checking the door there were no traps. Ulthok waited for the party to catch up. Without making a sound he indicated that everyone prepare for anything, they needed enter ready to attack. He drew the Wand of Frost. Although they were trying to save the dwarv they had found it was evident the there was no fight left in the poor creature. He waved the little man forward, whispering �Friend..you pull the open for us and stay here until it is clear to follow.� The man seemed to understand and grabbed the handle swinging the door into the hall. Ulthok lead the party through the door.. there stood two yellow face Githyankis guarding to the left and right of the door. Eight more of the strange fighters were lined up as in two rows a short distance past the two on his left. Roan and Lothor moved in to his right and he could see more creatures in the room. They had stumbled into the War Room. 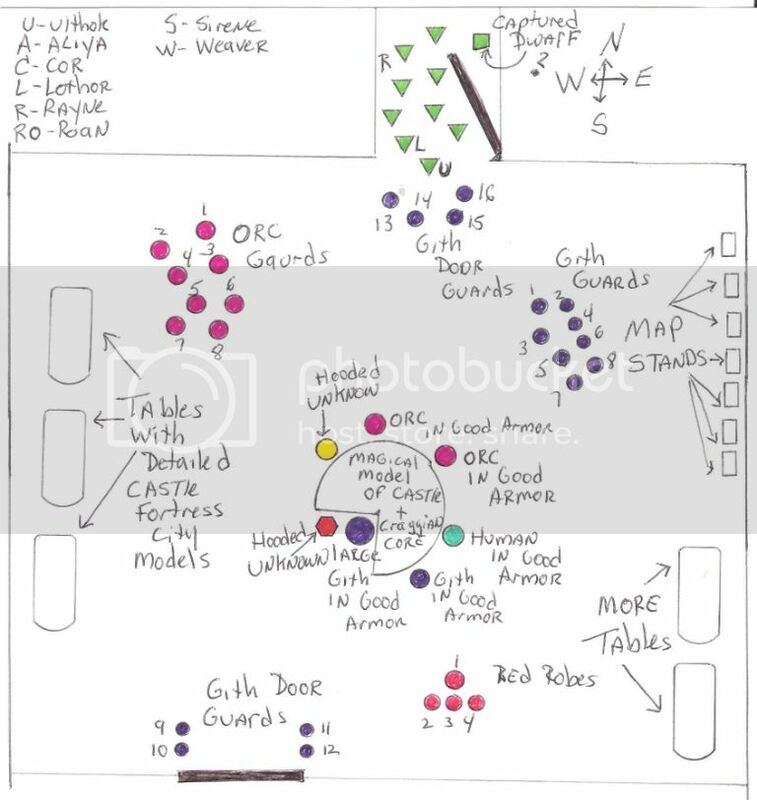 Several well armored being gathered around a large talbe in the center of the room and group of Orc milled to the right. Ulthok knew if he hesitated to study the rest of room he�d lose the element of surprise and the Giths would phase away. He had to leave the rest to his companions. So at nearly point blank range on the two guards to the left he released freezing power of a Cone of Cold over them and on to eight standing beyond. The party poured into the room past him and took up the attack. Posted on 2014-05-02 at 03:32:04. Now What Was I Saying????????? As the door opened Peri lighted off Ulthok shoulder to rise up for a better view of the room. She had turned invisible as it was her nature. From her lofty height she could see the gathered being around the table. They seemed so intent on what they doing, �Too much thinking must be so tiring for poor things,� she thought and released a spell of confusion on those around the table. She moved away toward the corner as she saw Ulthok raise his ward, she�d remember the bound back of Sirene�s spell and did wish to take that chance some might rebound. There she hovered ready to move in and give what she could. Posted on 2014-05-02 at 03:40:43. Once again a set of doors opened to reveal a horde of vile abominations. Gith warriors and hulking orcs filled the room alongside mysterious hooded figures. On seeing the wretched creatures, Sir�ne felt a phantom fluttering within her as if a death hungry raven beat its wings within her being. The cold, mocking laughter of the Dark Goddess filled her mind. The Lady of Retribution called for blood, and she would have it. Here and now, at the sight of battle, the fey enchantress faded into dreams leaving the Sir�ne to wear the mask of the dark side of the Goddess. A haunting dirge rose out from her lips to fill the air as her nimble fingers traced eldritch gestures in the air. Like the storm itself her voice rose higher and higher as her body moved wildly calling for the rage of the heavens. With a final gesture, Sir�ne lifted her hands up into the air and threw back her head letting loose an unholy scream vibrating with rage and death. In that moment all the power the witch raised was released into the room before her. A deafening clap and blinding flash of blue white light streaked through the room. For a heartbeat all vision was washed away with light. A booming roar filled the room heralding the return of sight, and revealing the destruction of the thunder's course. Posted on 2014-05-03 at 23:23:39. Alyia sighed as the party came to yet another door. Alyia couldn't help but mull over weavers somewhat cryptic statement. Alyia for once was glad her arcane knowledge was somewhat limited. Alyia moved so that she could see what the dwarf man traced into weavers hand. Languages had always fascinated her, her grandfather use to laugh and give her magic Sigil to decipher making her explain the use and context before allowing her to break down the individual marks an their condensations for each usage. the longest had taken her almost a whole month to finish, that had been her grandfather last summer with her. Xin's telepathic voice drew her attention as the party had begun to open the door. Alyia had slipped to the rear of the party. quickly slipping her hand into her pouch she thought to ready a fire ball, Xin's soothing voice pressed her to wait. "if we throw everything we have in the first round and they are stronger, which given this evil place is very likely. what is left for the second round if they pull our bluff?" Alyia nodded and stayed back, less one of the party called to her to come forth to aid them. Posted on 2014-05-04 at 00:39:06. As the door slipped open at the hands of Uthlok, Weaver smelt a stench he knew only too well. He lifted his head slightly and sniffed in deeply, �I smell you but will you see me.� A devilish grin came over the face of Weaver as he bent slightly. His hand reached into his vest where an inside pouch was hidden away, with the other he removed and eyelash and placed it into the other hand and with words spoken soft and clean he slipped into the room after a great blast of springtime thunder rang through the air. As Maggot now moved through the doorway he vanished from sight, the last anyone heard was the drawing of blades. OOC: Maggot cast Improved Invisibility, with Long Sword and matching Dagger he moved in unseen to engage his species enemy in a dance to what could be the death. Posted on 2014-05-04 at 04:49:38. Roan stepped through the doorway as Rime and Reason nearly leapt into his hands. The twin khopeshes had spent too long hanging by his side and it was time to do some real good. He felt strong, ready to take on anything with this crew. The Gith stood before him as he began to break off toward the right. It was some kind of a guard; likely it had been standing in front of the door before they had so rudely interrupted the party. Suddenly a flash of blue light lit the room. Roan heard a crackle just before a clap of thunder exploded nearby, and when the light faded it seemed to him that something was different. Was someone missing? What had happened? He pushed the thought from his mind. Only battle could matter now. Any other thoughts were distraction, and distraction meant death in this place. As he approached his chosen opponenent, the Ranger raised Rime to his left shoulder, preparing to strike a slashing blow. With his blood running hot, he muttered "Odin guide my hands" and brought the Khopesh down on the Gith. Posted on 2014-05-04 at 18:56:14.